Hi there! I hasten to share my happiness with you! Yesterday finally I received a package from amazon with my new book - "Embroidery Companion" by Alicia Paulson! It came!!! I was so happy when I received a notification - a small piece of thin paper with my surname uncorrectly translated into Ukrainian. We ran to the post office, wondering if we can get our package using documents with correct surname, waited in a queue, explained the problem with surnames, finally got the package - a carton box with two books. We handled it in our hands for few seconds, looked at each other and quickly started to open the box, unwrapped the books... and breathed a little bit of American air, that we believed left between the pages. :) We definitely miss US more and more after spending 5 unforgettable month there last year. Now I'll tell you a story about ordering these books. I was ordering a present for my boyfriend's birthday ("Thinking with Type" by Ellen Lupton - also a very good book with nice design, a great typography guide, we'll use it for our web development projects) and decided to make a little present for myself also. How clever I am. :) Anyway, we wanted to check buying on amazon from Ukraine, cuz we usually have problems with international purchases/shipments here. And of course, shipping to Ukraine isn't too cheap, unfortunately. I also had a $25 amazon gift card, that I won on a giveaway on one nice website I follow - GotChocolate.com and I was waiting for a good opportunity to spend that money on something useful and pleasant. I don't know why I had chosen book about embroidery, I used to do this some time ago, but I never was a fun. Well, now I understood that embroidery is a great thing for decoration. I can decorate my amigurumi, particularly their clothes, using it. 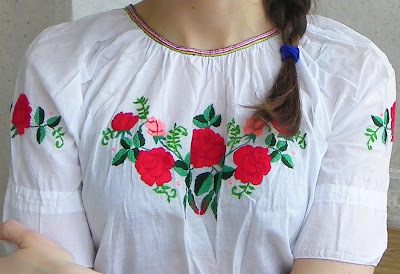 I always wanted to make my own handmade embroidered shirt - national Ukrainian dress. I even have details with transfered design on them. They just need to be embroidered and sewed together. Hope one day I'll finish this and will be able to wear embroidered shirt made by myself. For now I have his one made by my grandma. You won't believe, but I was wearing it when I was a child and it still fits me. I love it and I love wearing it very much. It reminds me about my grandmother and I know that she made it with love for me. That's much more valuable than shirts from the supermarket. And now enjoy some photos from my new book. They are beautiful and inspirational. I'm really happy that I have chosen this book. It will be a great embroidery companion for me. Lucky you! That looks like a very interesting book. The shirt is beautiful. I love the embroidery the wonderful grandmothers did. Thank you for your kind words on my blog! I have to say your blouse is so beautiful I bet you treasure that, how wonderful that it still fits. Imagine the hours of loving work that went into making it for you. Thank you for visiting my blog, Kandi! You are right, I highly treasure what my grandma made for me, her love and patience mean a lot for me.